This is one of my favorite recipes so far. I call it jollof on steroids. Why? you ask…Well because it’s damn delicious! I know you’ll say “errm no frying” “no oyel”(oil), so what’s jollof about it abi? Abeg cool down first. Errm yes I’m sort of excited….well really excited sha! Anyway, I’ve been on #Lin i.e. Losing it Nigerian for a few weeks and I have to say that it works. My coats became loose within a week, my blouse fit better and I’m eating all the right foods. Lin is a fitfam program created by Ronke of 9jafoodie; which teaches you how to cook Nigerian foods and lose weight at the same time. More often than not, during weight loss we have the tendency to turn up our noses at Nigerian dishes thinking it’s either too starchy or oily. Well yes, but you can modify how you cook your Nigerian meals and stay healthy. Ever since I started the regimen, I started learning how to cook the right foods. No more concoction salads everyday. Not that concoction salads aren’t great, but pheww! The term “oiless” comes from how the rice is cooked and how much oil is used compared to the usual amount. The oil from the meat stock and the oil added at the end are the only ones used; not forgetting that the coconut milk; though optional does have oil in it. I used coconut milk for flavor. The usual frying of the stew with herbs for jollof rice is a base for the smokey taste and to create this effect, I added coconut milk and roasted the peppers and tomatoes. Not only that, I’ve been using coconut oil a lot lately and I have to say; it gives no regrets. I happened to meet Helen and she wrote this wonderful article about the wonders of coconut oil…checking it out will give you no regrets either. Now I can splurge my appetite on a little jollof rice without feeling guilty. 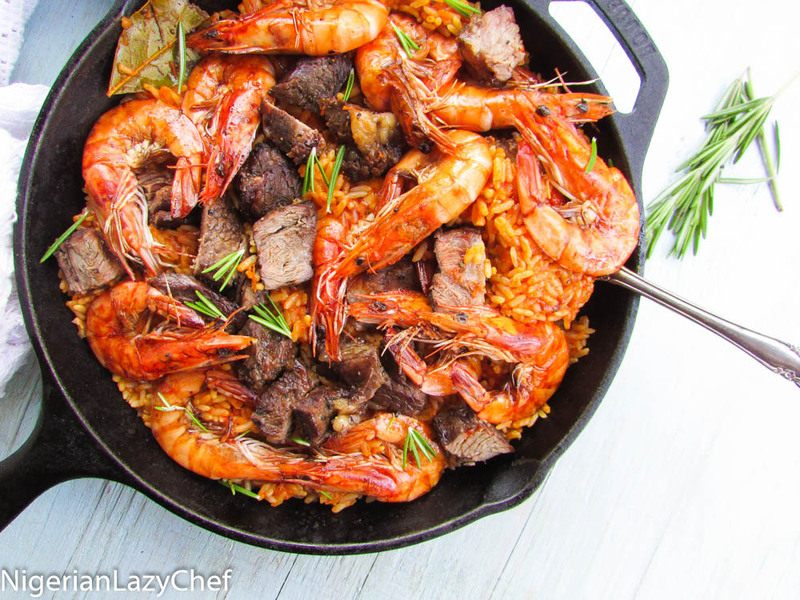 For this pot, I served it with chargrilled beef and shrimp and it was absolutely amazing! 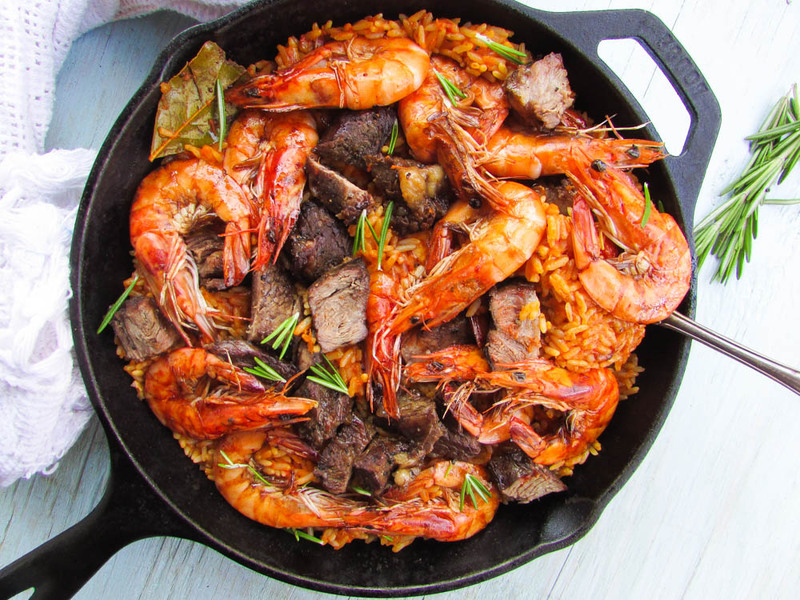 We do have a recipe for oven cooked jollof rice on the blog…. wash and chop the tomatoes, peppers, onions, and ginger. Place in a baking sheet along with the garlic. Sprinkle on a little salt and place in a preheated oven at 400-425 degrees and roast for about 30-40 minutes; then blend into a puree(leaving a hand full aside). Thoroughly mix the rice with the paprika, curry, thyme, bay leaves, black and white pepper; then pour in the coconut milk if using and tomato puree. Pour in the meat stock and stir. Check for seasonings and bring to a boil. Cover with a foil wrapper or a clean grocery bag and reduce the heat. Cook for about 15minutes. Stir in the nut meg, the hand full of roasted tomatoes and the oil. If the rice still needs cooking simply turn off the heat and cover with the foil and the pot's lid and let the heat left in the pot steam the rice. If you want your rice a little softer, add water or meat stock and cook for another 5 minutes. If you cannot roast your tomatoes and peppers, simply blend and boil the puree to remove the liquids(To boil, simply pour the puree into a pot and bring to a boil. Let it cook until all bubbles have disappeared and the puree has become a thick paste. You could also cook the rice in the oven on 350 degrees if you wish. This entry was posted in Eating Healthy, Healthy Eating, Healthy Nigerian, Healthy Nigerian Dishes, Healthy Nigerian recipes, jollof, Jollof rice, Nigerian Rice Recipe, Nigerian rice recipes, Oiless recipes, Rice, Rice Dishes, Rice Recipes and tagged Cast iron jollof reice recipe, cast iron recipes, jollof, jollof recipe, jollof rice, Nigerian food blog, Nigerian oiless jollof rice, Oiless jollof rice, oiless jollof rice recipe.